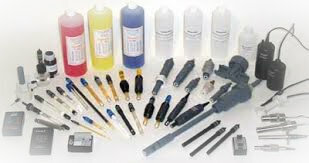 Sensorex is a leading manufacturer of probes for water treatment applications. Our probes and electrodes are used in water and wastewater treatment, chemical treatment, galvanization, boilers, chillers, pulp and paper, medical, laboratories, environment and Wide range of other applications. The intelligent SAM-1 ™ Sensorex® Aqua Meter turns your smartphone or tablet into a powerful portable pH, ORP, or conductivity analyzer. Simply plug the SAM-1 ™ into the audio jack on your smartphone or tablet, connect the smart sensor, and you're ready to take precise action. These pH & ORP electrodes are a direct replacement for Acu-Trol® controllers. PPS construction electrodes offer improved chemical resistance, increasing the volume of gel inside the reference probe extends the life of the electrode. Advanced signal system for better noise reduction, 1/2 "NPT for on-line installation. These pH & ORP CPVC electrodes are a direct replacement for Strantrol® controllers. These electrodes offer improved chemical resistance, increasing the gel volume inside the reference probe extends the life of the electrode. Advanced signal system for better noise reduction, 1/2 "NPT for on-line installation. BNC 4-20 mA The pH electrodes series S8000, one of the special models for weak ionic environments, or samples containing HF acid. In-line or submersion mounting. Several electronic modules are available as an option for amplification or 4-20 mA two-wire system is required. Toroidal Multiple 316SS conductivity Tri-Clover fittings sanitary 1 to 2 inches Our growing range of conductivity and resistivity sensors are available with contact electrodes in graphite, platinum, 316 stainless steel, and titanium. High temperature for high pressure boiler sensors as well as sanitary flange models are also available. Inductive toroidal (toroidal) sensors are also available. Very reliable galvanic technology. Our DO 12mm sensors can be used with laptops, laboratory and galvanic instrumentation online. Our aquaculture and wastewater sensors are designed for long-term deployment. They are also available with optional 4-20 mA outputs. Sensorex also offers transmitters with 4-20 mA output. The UVT-LED family is the smartest transmittance sensor in the world that uses an LED instead of a mercury-based lamp as a UV-C light source. The use of an LED in the Sensorex UVT-LED UV-C ensures extremely stable measurements under all conditions over an extended lifetime. Transmitter powered with 24 VDC (4-20 mA loop) two-wire, powerful and economical. 4-20 mA transmitters for pH interface with PLC or data loggers.